A title as curiously maligned as it is anticipated, PlayStation All-Stars Battle Royale brings brand-centric 2D arena brawling into the HD era. Matt had a chat with game director Omar Kendall, and discovers that gamers weren't the only ones skeptical about the title's viability. Omar Kendall loves a good scrap – has done so since he was 13. He first learned how to beat down fools in Street Fighter II, and the bond he developed with the Street Fighter series – “the fighting game that defines the genre”, he says – heavily influenced not only his choice to develop games for a living, but also the kinds of titles he would work on. Simply put, the man loves fighting games. He has the resume to prove it, one that now also lists Sony’s upcoming arena brawler, PlayStation All-Stars Battle Royale. Kendall describes his main role at All-Stars developer Superbot as one of guidance – it’s up to him to make sure all the individual groups working on the project stay true to the vision of the game and move in the same direction. Fortunately, Kendall’s time developing UFC, wrestling, X-Men, and Mortal Kombat titles has taught him much about the fighting genre. According to Kendall, the lesson most applicable to All-Stars is that many fighting game conventions are not well-known outside of the fighting game community. 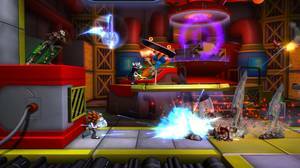 Fans of characters Parappa the Rapper or Sly Cooper who won’t necessarily have much fighting game experience are going to come to All-Stars, he believes, and so the team at Superbot are striving to keep things very simple. That means a simple interface, easy controls – most attacks are a direction and a button – and an easy-to-grasp super system. The traditional fighting game health system is flipped on its head, and instead characters accumulate All-Star Power (AP) to fuel super attacks. The three levels of super are the only way to knock out opponents, and knocking out opponents is the only way to score points. Once adequate AP has been accumulated, a level can be purchased, or the player can save for the next level, effectively gambling that they will still be around when their meter once again maxes out. Simple. According to Kendall, this wasn’t always the way. Earlier in the development cycle, item and environmental hazards also able to knock players out. It was only in the last year that the team moved away from such a system. “Death was meaningless because you died constantly, and that took the focus away from the super system, which we felt was the heart of our game,” he explains. Hazards and items now make targets dizzy or rob them of AP rather than killing them outright – a change that Kendall cites as the biggest the game saw since its development began. “It brought the game together in a much better way”, he says. Of course, before any of this was considered, the rights to each character had to be obtained and despite popular perception, Sony’s full character roster was not automatically up for grabs. Creators had sway over whether a character would appear and how they would be represented, so the desire to do justice to each one loomed large over Kendall. “There are characters in this game that existed before I started playing video games, and [character creators] don’t want characters to be damaged,” he says. “Almost everyone was a little apprehensive.” His solution was to pay particular attention to capturing the essence of each character, so a lot of research was done “to make sure Sly Cooper came off like Sly”. Replicating something like Kratos’ combos was easy, he reckons, but other characters took research and a little creativity. Fat Princess, for example. “We gave her more activity,” says Kendall. “Her villagers help her out so they make up a big part of her move set, both supers and normal attacks. Creatively that is a little more fun to make. With Kratos there is an obligation to have ‘square, square, triangle’.” That attention to detail paid off, and once character owners saw that Superbot wasn’t trying to do a disservice to anyone, that initial wariness turned to enthusiasm. In fact, Ken Levine went beyond the call of duty, writing all the lines for the Big Daddy and Little Sister in the game. It's clear from our chat that Kendall believes in his game 100 per cent, but he's also cognisant of the way it's being talked about online, and thinks that it will surprise a lot of people. “This won’t come out the way I mean it to," he says, choosing words carefully. 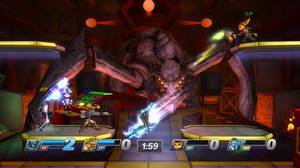 "But: it’s a really fun, well-thought-out fighting game. There is a surprising amount of skepticism about the game. When people play the game it makes a lot of sense – we’ve seen that in the closed beta. It’s fun. It’s a style of gameplay that isn’t serviced as much as it used to be.” The logical question then: is PlayStation All-Stars a silver bullet for lacklustre Vita sales? “I sure as hell hope so!” he replies, laughing. 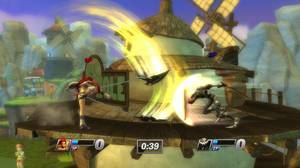 PlayStation All-Stars Battle Royale is scheduled for release on PlayStation 3 and PlayStation Vita on the 22nd of November. Sony gets its battle on.